~ updated August 14, 2017. As environmental temperatures decrease, a calf’s need for energy increases. 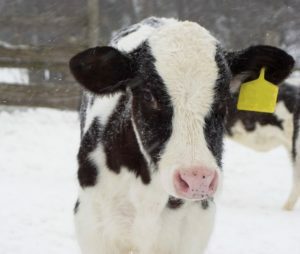 Calves need between 1.0 and 1.3% more energy for each degree the environmental temperature drops below 50° F. Below this temperature, calves must increase heat production to stay warm. A sound cold weather feeding strategy is an important part of keeping calves warm. Calves that are younger than three weeks of age have a larger surface area relative to their body weight and may not be able to withstand changes in environmental temperature as well as older calves. These younger calves may need additional energy beginning at environmental temperatures as high as 59° F. Keep in mind that each calf is different and no one temperature describes all calves or all situations. Exposure to wind, sun and moisture as well as bedding and housing all influence how environmental temperature affects calves. This post will explore these changes in energy and effects on solids (concentration) of milk or milk replacer. When the environmental temperature falls to 30° F, the calf needs about 25% more energy than at 50° F. As the temperature drops to 10° F it needs 50% more energy. The table below shows the energy provided by one ounce of milk replacer that’s formulated to 20 percent protein and three different fat levels. The energy provided by a 7-60 high fat energy supplement is also shown. Values are on a dry matter basis. The total energy in a feed is a combination of the energy from the protein, fat and carbohydrates contained in the feed. As seen in the table, using a milk replacer with a higher fat percentage does not increase the overall energy by very much. Simply switching to a higher fat milk replacer during cold weather and feeding at the regular rate, will probably fall short of the calf’s increasing energy need during cold stress — maybe by a lot. The 7-60 in the table is a high fat energy supplement, providing 7% protein and 60% fat. This energy supplement provides about 30% more energy than milk replacer. 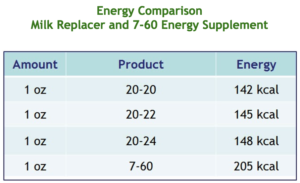 The higher energy density of the 7-60 energy supplement makes it possible to increase energy consumption without increasing solids as much as what occurs when increasing the concentration of milk replacer powder in water. Table 2 shows what happens to solids when you add more milk replacer powder or use an energy supplement to meet the calf’s increasing need for energy. The left column lists three levels of powder commonly used when mixing milk replacer. The solids levels of the mixtures are provided in the next column. For example, when you go from 8 ounces to 10 ounces of powder you increase the energy by 25%. Solids increase from 12 to 14.5%. Increasing feeding rate to 12 ounces of powder increases energy by 50%, but takes solids to about 17%. A 50% increase in energy requires 12 oz of powder at a solids level of 17%. Meeting these energy needs with the 7-60 energy supplement lowers the final solids to 13.5 and 15.5%, respectively. You can also see what happens when your normally feeding rate is 10 oz and 12 oz of powder and you increase the concentration of powder. Solids levels of 17-18% are often used with intensive milk replacer feeding programs. Concentrating solids beyond this point increases the likelihood of problems. Highly concentrated milk replacer, especially when fed in large volumes, pulls water from the calf’s body and moves it into the digestive tract. This may ultimately lead to scours and dehydration. If you choose to feed at higher solids, even 17 -18% solids, access to clean water is a must. As the tables demonstrate, a high fat energy supplement may offer an advantage when solids are being altered to meet the calf’s energy needs. The table also shows that there are situations where it is better to simply feed more of the regularly concentrated milk replacer rather than concentrating it. You can either feed more at each feeding or add another feeding during the day. Calves older than three weeks of age should be eating a significant amount of starter and can offset much of their need for energy during cold stress through increased starter intake. Access to water is a necessity for increasing starter intake. Calves under 3 weeks of age are dependent on milk or milk replacer to meet their energy and protein needs. Very young calves may have difficulty consuming the energy they need during cold stress by drinking more milk and milk replacer. Some calf raisers extend colostrum feeding to help improve the level of nutrient intake of these calves. Compared to the values in Table 1, the average energy value of one ounce of colostrum is about 185 kcal. In any case, you may need to go beyond a strictly nutritional solution. 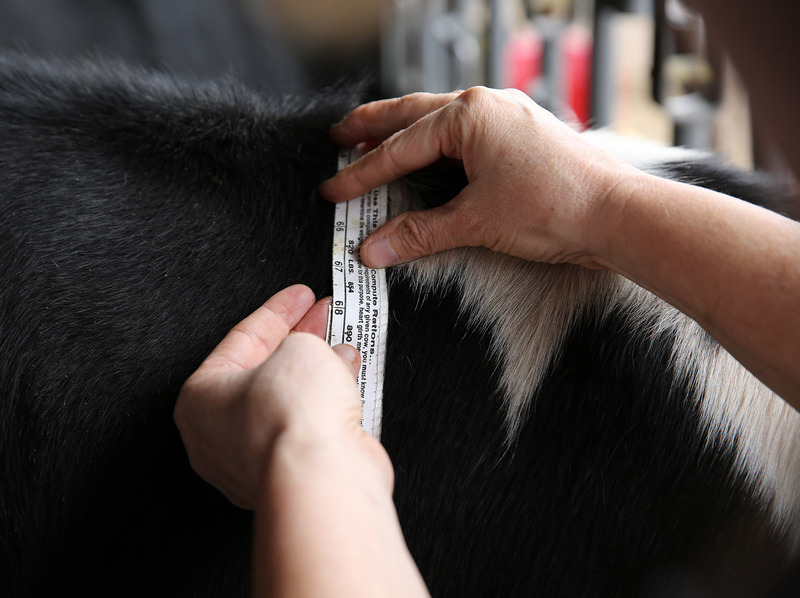 You can use tools such as calf coats which can greatly increase the calf’s insulation against cold temperatures.